Jakarta Old Town is one of historical tourism attraction destination which located in Kota, Jakarta. Currently, the DKI government is taking seriously the revitalization in the area. 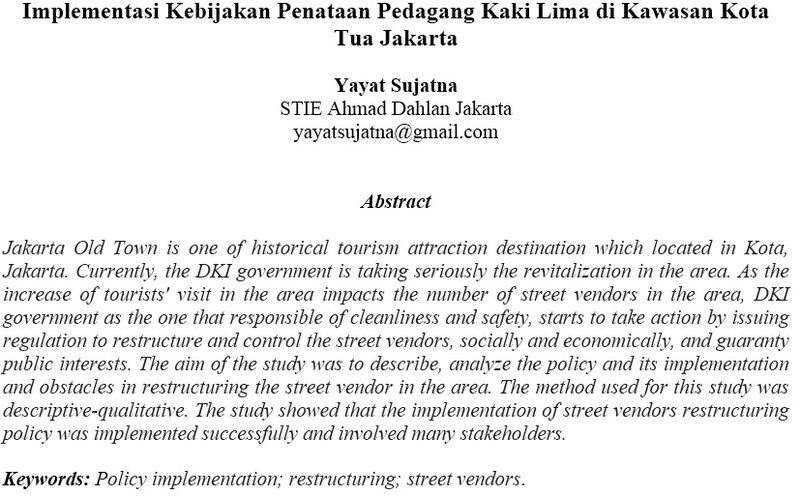 As the increase of tourists' visit in the area impacts the number of street vendors in the area, DKI government as the one that responsible of cleanliness and safety, starts to take action by issuing regulation to restructure and control the street vendors, socially and economically, and guaranty public interests. The aim of the study was to describe, analyze the policy and its implementation and obstacles in restructuring the street vendor in the area. The method used for this study was descriptive-qualitative. The study showed that the implementation of street vendors restructuring policy was implemented successfully and involved many stakeholders.